To take a small club who were previously unplayable in an unedited game from the Blue Square N/S to Premier League and Champions League glory. 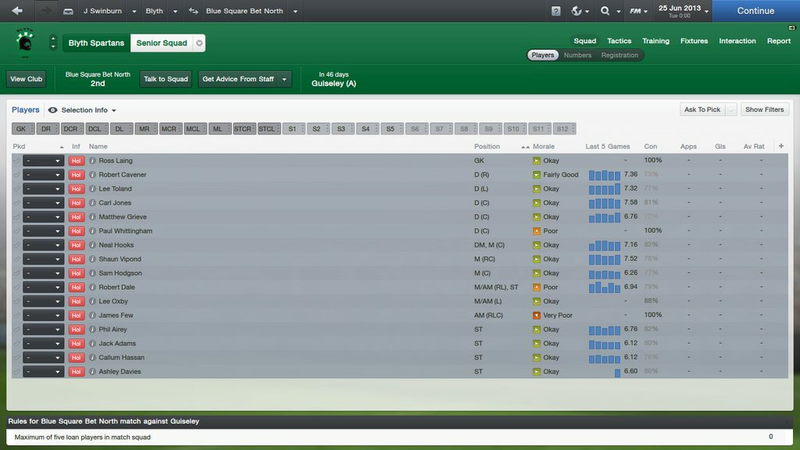 Load a game with the English leagues only, with the Blue Square N/S selected. The attribute masking, real players and transfer boxes ticked and the add key staff box unticked. It should look like this. Just like previous years, the players for the newly playable clubs need to be added which can be done using a custom database. 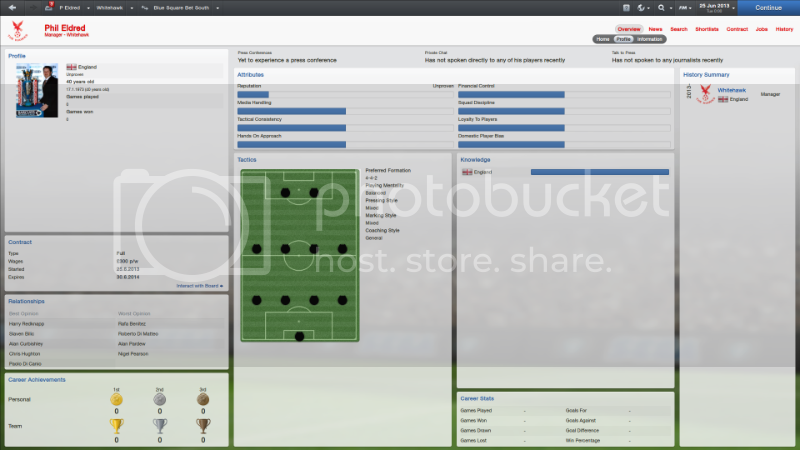 The players from the three feeder league have to be added, which looks like this. If people wish to add extra players, any players from continents may be loaded, but not from individual countries. This is hopefully to provide a challenging game later on, without making the lower leagues too easy with too many cheap talented players available. Go on holiday until 25th June, this shouldn't take too long, perhaps about an hour. Saving on 24th June may give you a better choice of teams by reloading the game then going on holiday for one day, I would strongly recommend trying this. Retire your 'Holiday Man' manager, his work has been done. Add a new manager, the options are up to you but 'past experience' must be set to the lowest possible which is 'Sunday league footballer'. I understand that choosing different nationalities may have an effect later on, but I trust people will be sensible with this. I would expect people to use their own true nationalities. 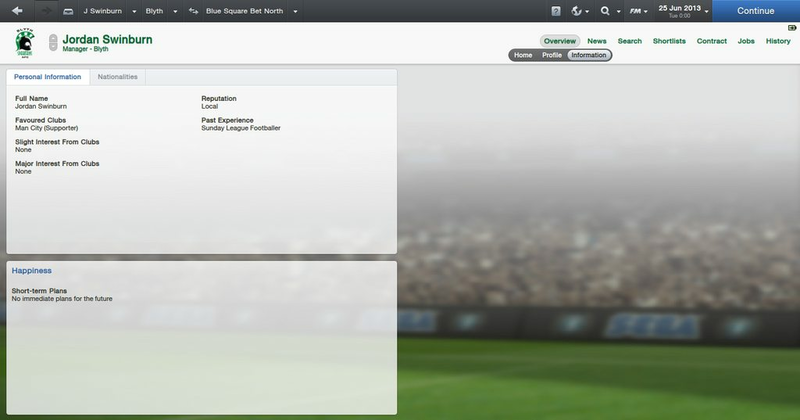 When adding a new manager, choose one of the new clubs promoted to the Blue Square North or South to manage. A quick way to check the new teams is to find the 'England Overview' team, then the 'season summary'. Just above the FA Cup summary you should find a list of six new teams. They should also appear in this list which also shows the reputation of the possible clubs. The reputation should act as a difficulty level, the lower the reputation, the harder your game should be (reputations will be added once available). It is now up to you to manage this club all the way to the Premier League title and UEFA Champions League crown. Assigning parent clubs and loaning players is completely up to the player, although it should be noted that on occasions a parent club can lend players which will make the first season or two slightly less of a challenge. It is completely up to you how you play this one, but everyone knows real men don't use parent club loans. Personally, I like to assign a parent club for financial benefits but never take any players on loan from them. 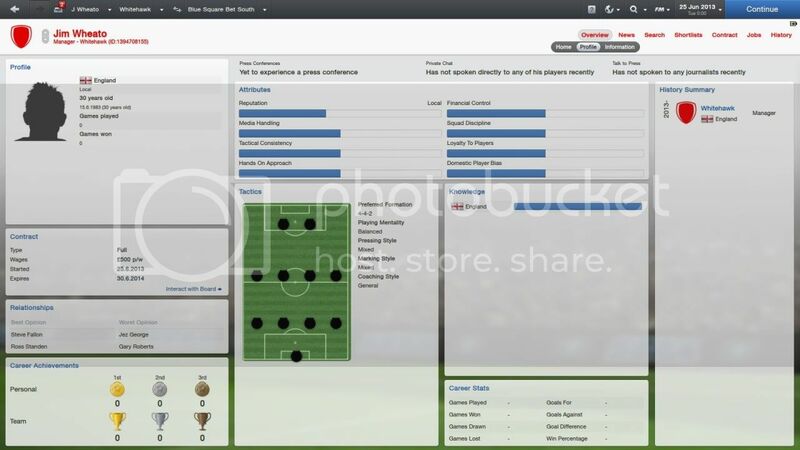 No external utilities such as scouting programs should be used and the database should be unedited, this is particularly important with the new changes to the editor. Should SI release a data update, this would be allowed but any other data updates are not. It is advised that people should update using the latest patches as they are released, which should be easy with Steam. Just as always, no extra leagues can be loaded, this includes extra leagues being added during a game. Use of save game editors is strictly banned, whatever the reason. When you join the challenge, could you post a screenshot of your manager's profile on the 25th June. 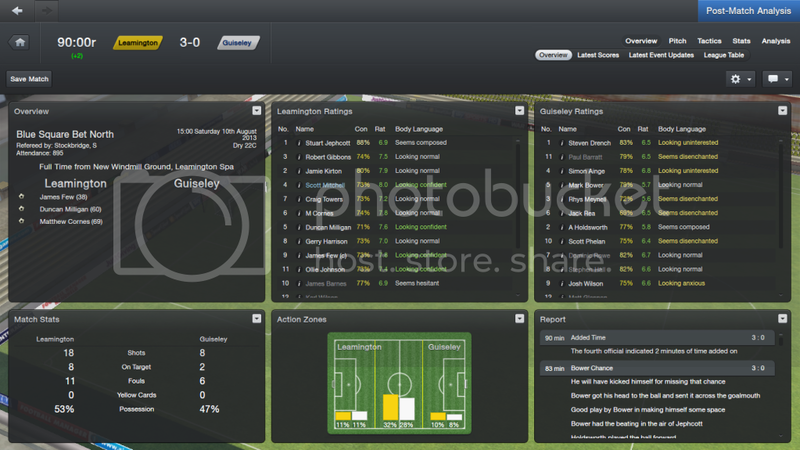 dafuge's FM13 challenge Steam group - join here if you wish to chat via Steam. I've been looking forward to this Let the reloading begin! Is anyone going to start this straight away in the Beta version of the game? I will be, although I probably won't get started until tomorrow night. Me too, just going to get into the shower and then settle in for the night shift of FM. Who are you hoping to get? Does it matter which version of the game you play with - regular or classic? Whitehawk, just because I love the name and they'll be a big challenge. I was reloading earlier and they came up a few times. I had to start again as I forgot to add the regional players. I'd not even considered that. Is it possible to meet all of the rules using FMC? Sounds like an awesome team already! Here we go. I'm at reset day, not sure who I want so lets see who comes up. Haven't seen anything that lets you amend attribute masking, having real players (although it is by default) and allow you to tick both transfer boxes and add key staff box. You can though opt to start with Sunday League rep.
With it being new, I'm not really sure how to treat it. Should there be a second thread for FMC games or keep it all in here, even if the two games are different? I don't think we've ever had FMH games in here, should it be treated the same as those? Hasnt classic got the unlockables like extra transfer funds etc? or is that just challenge? They do feature in FMC, but I'm not sure if they are optional or not. So far I've done about 15-20 reloads and seen Whitehawk alot. I think they will be a very popular team this season. I'm still looking for other teams. Got a Chippenham save as a back up. Dont worry I'm sure you will get them again. Just got St.Neots and Bashley but dont really like the look of either of those. Glad to see this is back again this year. Also very excited to see that dafuge may be back doing it this year I haven't been able to keep up with your story thread this past year and I'm looking forward to it all being in one place. Mighty Chippenham will be returning this year, though I likely won't start until after the day 1 patch. By then a few of you may have completed the challenge . I haven't yet decided whether to add in geographical restrictions yet. It makes it so much more realistic, but is really time consuming to set up. As far as FMC, I don't know enough about it to know whether it will be even. Obviously unlockables would have to be forbidden, but I really haven't looked into what else is different. As far as additional players from continents, which option should be used? It looks like there are many more options than last years version. Are we adding only internationals or players from top clubs? 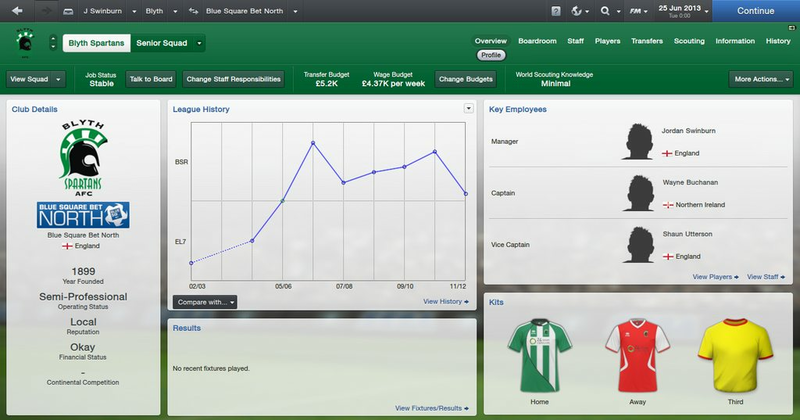 Looks like ~ 10 of the people from last years steam group have already made the jump to FM 2013. I'm looking forward to seeing the detailed updates start flowing in! Don't make me have to beg for them (It wont be pretty!). Have you got a save with them on that you can upload? Just finished Holiday, about to start looking for a team. Kinda want to go for Chippenham as have played them for the last few versions of the game, but ill guess I see who comes up! I've tried to leave it a bit more open this year to allow people to bump up their databases. I've just got AFC Fylde and I'm really tempted to play as those. may give it a bit longer reloading but there my top choice so far. Yes. I'll upload it somewhere (not sure where). I've done my holiday season, but I've no time for the fun of reloading. I'll save that for tomorrow night. New manager of St Neots! The team I wanted from the beginning have just appeared. 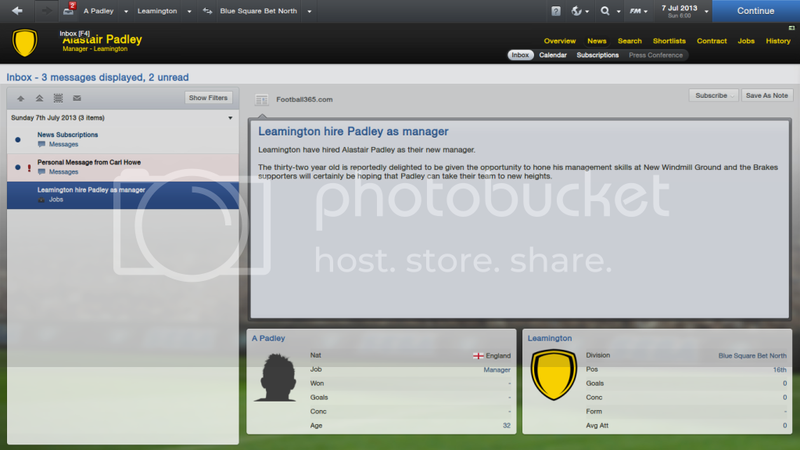 Introducing the new manager of Banbury United. 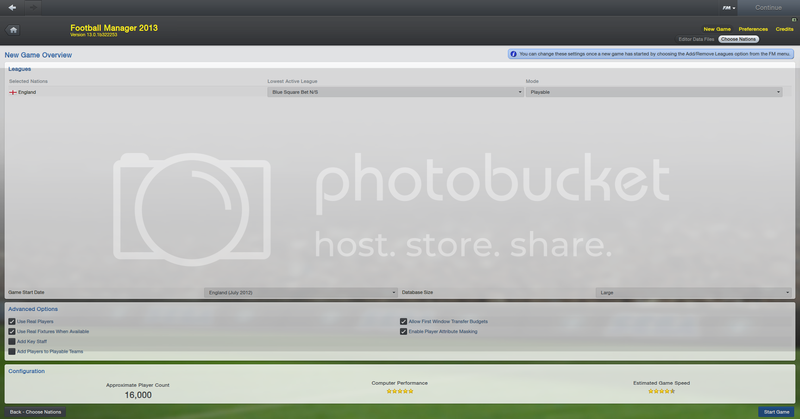 OK, this save has Carshalton, Weymouth, Whitehawk, and FC United (handy for me if I decide Whitehawk are dull) promoted. It may be a good idea to post any noticable differences between FMC and Career mode to help dafuge determine if FMC is allowed here. Like board requests, scouting limitations and so on. As reloads produce saves aare we going to start a post with ll available saves like usual? Also any news on rep status for those of us looking for the sub 1000 rep range? Don't you need the editor to check team reps? I doubt the editor won't be available until the full game is released. If anyone sees Cray or Rushall (preferably Rushall) pop up while they're reloading, could you do me a massive favour and send me the save? I'd really appreciate it. And so it begins! 5am, FM downloading and in 12 minutes we'll be ready for the reloading. Should only take a few with Blyth. Wow - Banbury United didnt go to plan. Had just played my 3rd league games and then I was sacked due to a board takeover. I didnt have a back up save so I'm back to reloading. Downloading now. Unsure wether to start now or wait but likely will jump in and see how it goes. Now to decide which team to aim for in the next 15mins. Blyth Spartans are delighted to announce the unveiling of our new manager, Jordan Swinburn. Although a relatively young and unknown manager, Jordan has expressed his desire to take Blyth to the top of English and world football and everyone here at Croft Park shares and supports that desire. 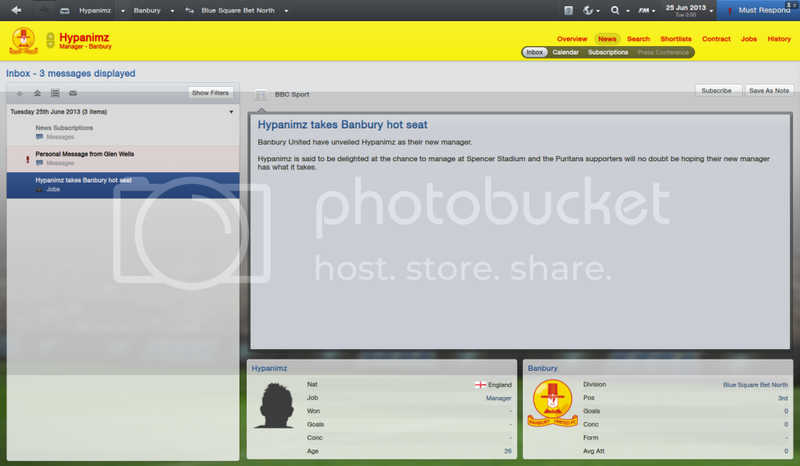 After the shambles at Banbury I'm jumping straight back in as the manager of Chippenham. Wish me luck. I think I have narrowed who to try and be to the following. Good luck reloading. I've done about 2 hours of reloading and out of those teams only seen St. Albans.